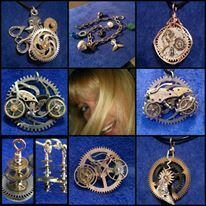 Necklaces – Chaordicwear – Up-cycled, One-of-a-kind, Handmade Jewelry you can Wear everyday! Making Order out of Chaos! Upcycled clock parts and gears :) I have too many ideas of what to do with these. Any requests?